Finally the PSP gets a version of the classic Tetris, it has been a long time coming but by god it’s actually worth it. 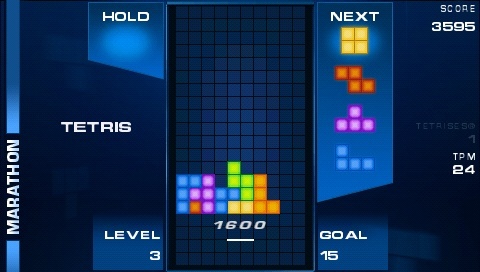 Tetris is available via PSN only (for a measly £3.99) and is labelled as one of the new PSP “minis”. From the moment I clapped eyes on it I was in love, the graphics are sharp and colourful, the music is great too, kind of techno remixes of the old Tetris songs. and of course the original mode will still gives you enjoyment but with this version the “variants” are where it’s at. Each variant is a twist on the original formula, some that I’ve played before (like gravity where dissociated blocks drop down in the spaces below) and some variants I’ve never played, some are more challenging than others but the game will make you play them in order to unlock more. In every variant game you have only to score 40 lines and after that it’s over, but you get more points for finishing quickly and more points for the more “Tetrises” you get. So play your cards right and you can get some nice times and/or scores. My favourite variant is “Treadmill”. every time you drop a piece the whole screen moves to the right by one block and pops onto the left hand side, it’s confusing but fun. The hardest I think is “Split” where the playing field is split down the middle and each side is independent except for when scoring lines.